By Michael J. Cooney, D.C.
Clinical Director | Calmare Therapy NJ USA. My 30-year career has revolved around treating pain. Since I was a kid, I was always trying to “fix” everybody. In high school, I played on the tennis team and was the self-designated team doctor. Decades later, Dr. Kelly and I grew frustrated that we could not lessen the pain of some of our treatment and medication-resistant patients at our clinic located just outside New York City. So we went in search of a non-invasive pain treatment to help the patients dealing with severe neuropathic pain and we discovered Calmare. We introduced this technology in 2011, and many of our patients were frustrated RSD sufferers who had already tried all the painkillers, Ketamine treatments, spinal cord stimulators, nerve blocks, surgery−you name it. And none of them helped to lessen their pain or other physical symptoms. In many cases, patients have told us Calmare was their “last hope.” I think one of the reasons we’ve been so successful in helping CRPS patients may be attributed to the fact that as a chiropractor, I have specialized training in the relationship between the joints, bones, muscles and nerves. As a result, I have a clear understand of the optimal placement of the device’s EKG-like leads in conjunction with the original injury or surgical site. We have achieved many successful patient outcomes in the past five years, many who arrived at our clinic reliant upon wheelchairs. But let me be clear–unfortunately, this is not a miracle cure. It does not work for every patient. And over time, the pain condition can return for some patients, so occasional booster treatments may be required. I’ve listed some of the most common questions we’re asked below, as a way to explain what this treatment is—and is not. How does scrambler therapy actually work? It uses a biophysical (using physical methods) rather than a biochemical (drugs) approach. The device relieves pain directly at the pain site through small electrodes through which a ‘no-pain’ message is transmitted directly to the nerve for about 35 minutes using 16 distinct algorithms. During the treatments, the patient’s pain steadily decreases as the brain gets the ‘message’ that there is no more pain at the original pain site. In some cases, pain relief has been reported in as few as one to three treatments, but each patient’s case is unique. There are several providers (about 15-20) throughout the U.S. This is a ‘provider dependent’ therapy and I encourage you to choose a “Calmare Certified Provider,” signifying they have treated a certain number of patients successfully, obtained specialized clinical training in the safe and proper use of the device, and have submitted positive clinical data. I would also ensure they have successfully treated many CRPS patients. As the doctor, how do you know if the treatment is going to work for a new patient? In my experience, after the second or third treatment, if there is no significant reduction in pain, it may not be a viable treatment solution. During this early phase, we are looking for a lessening in the level of pain, which tells us we are beginning to disrupt the pain message. With this said, the vast majority of CRPS patients have achieved very substantial relief of pain and physical symptoms for prolonged periods of time. Does Calmare work for CRPS Type 1, Type 2 and Fully Body RSD? In our practice, we’ve seen outstanding outcomes in all of these types of CRPS, including patients who presented with substantial physical symptoms such as welts, rashes, swelling and open sores. Does it need to be repeated on a regular basis for CRPS? It depends on a few key factors: severity of the condition; how long the patient has been living with RSD; additional medical issues; and if the patient is following our post-treatment protocol. Some patients need to come for booster treatments yearly, a few more often, and some never require further care. Most patients need one treatment for 10 days (Monday-Friday) lasting about 35-minutes each. How is the Calmare device different from a tens machine? The scrambler machine has been awarded a patent from the U.S. Patent and Trademark Office which identifies the device as a unique entity, unlike anything else in the market (i.e. a tens unit). 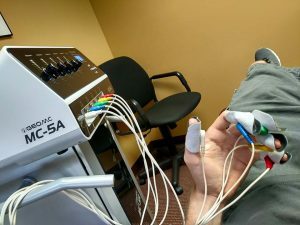 The Calmare MC-5A device creates a low-energy electrical impulse which travels through the patient’s nerves delivering a “no-pain” signal to the brain using 16 distinct algorithms. This process “tricks” the brain that the area of pain is normal and eventually results in prolonged pain relief. TENS units use high energy electrical impulses to block pain signals or distract the brain, but when treatment stops, the pain usually returns. It emits an electronic message over one single algorithm. A tens unit is self-administered by the patient whereas the scrambler is administered by a trained medical professional. Are there any clinical trials that evaluated this treatment for CRPS specifically? I am one of the first Calmare providers to treat CRPS sufferers. I have shared my findings and outcomes with key pain management research hospitals and found them to be receptive to our data. In October 2015*, the Mayo Clinic published an article about a CRPS patient’s positive outcome after having the standard 10-treatment scrambler therapy protocol, although the clinical study was formally designated for people who had undergone chemo. [This was done] under the direction of Dr. Charles Loprinzi, with whom I have spoken over the years. We monitor all of the ongoing hospital-based research and clinical trials and post updates on our website. What are the possible side effects or negative impacts from having scrambler therapy? I love that question because there are no reported side effects. It is also a painless therapy, but for people with severe sensitivity to touch, the first treatments can elicit some discomfort, obviously, when our leads are initially placed. But this is usually alleviated as the therapy progresses. I’m currently taking opioids to help me manage pain. How will this affect my Calmare treatments? Physician-prescribed opioids are not a problem when using scrambler therapy, however, anticonvulsants and antidepressants appear to dull the pain center, which can decrease the overall response to Calmare. I can go into greater detail on this subject with each patient. Who or what kind of medical condition is not suited for this treatment (contraindications)? Patients with pacemakers or automatic defibrillators; history of heart attack, aneurysm clip, vena cava clips, or skull plates (however metal implants for orthopedic repairs are allowed); pregnant and/or breastfeeding women; history of epilepsy, brain damage; and use of anticonvulsants, other than for neuropathic pain control. Under medically-supervised care, neurolytic pain control treatment should be carefully reduced to 0 four weeks before therapy begins. Worker’s Compensation in the U.S. has been willing to reimburse in several instances. Some of our patients have been successful in winning reimbursement (after treatment) from their medical insurance companies. Keep in mind, most of their claims were originally denied, but when they were appealed, some patients earned some reimbursement. Is it possible to give us the numbers or percentage of success using Calmare treatment for CRPS/RSD patients? Speaking specifically to my practice alone and referring to CRPS patient cases, we have seen a success rate of 75 to 80 percent. “Success rate” means that the level of chronic pain and other physical symptoms have been substantially decreased−or eliminated. How many CRPS/RSD patients have you treated? Since we started treating CRPS and RSD patients in 2011, we have treated nearly 500 patients from 15 countries. 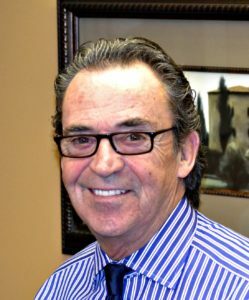 Dr. Michael Cooney is one of 10 certified providers of Calmare scrambler therapy in the U.S. He specializes in treating patients battling severe neuropathy as a result of CRPS / RSD, fibromyalgia, diabetes, shingles, post-surgical pain and pain after chemotherapy. To learn more, visit www.calmaretherapynj.com or call 201-933-4440.